Informed by several years of marketing experience in New York’s vibrant nonprofit arts and culture community, Hannah arms nonprofits with the insights and tools that will help them thrive. 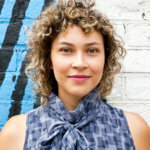 Prior to joining the Big Duck team, Hannah graduated from Columbia University with a Bachelor of Arts in Film Studies, focusing her academic work on the way movies reflect and shape racial, social, and cultural dynamics. During her time working at the Brooklyn Academy of Music and the Film Society of Lincoln Center, she championed diverse voices in the film industry while honing strong communications skills. She also managed the marketing campaign for the 2018 New York International Children’s Film Festival, implementing a new visual identity and drawing over 25,000 attendees. Outside Big Duck, Hannah may be found seeking recommendations at her favorite comic book store, eating arepas, and, of course, planting down at one of her favorite movie theaters. My driving mission is to connect people to resources, ideas, and causes that empower and ignite them. Big Duck is a singular home for pursuing that work.